Sometimes the concept of a digital photo frame becomes quite vague as they start to have more and more applications become attached to them. Take the Keian Japan P71-A2-JP, a box-like photo frame that can act as a printer, audio player, and even the option of adding an external hard drive. The printer function is quite interesting. Imagine having a friend over, and he or she looks at your 7-inch screen with a 480 x 234 display. If your guest wants to take one of the photos with him or her, all that is required is to hit a button, and he or she will receive a 100 x 150 mm size photo with 300dpi resolution. So, it’s a photo frame that prints photos! What will they think of next? MP3 file support, for one, but that has been done on other digital photo frames. 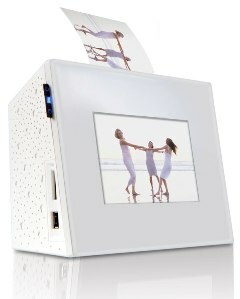 One thing that I haven’t seen on other digital photo frames is the option to add on an external hard drive. I mean, usually I see just a SDHC card reader, or an option to take photos off of a memory stick. Actually, the Keian Japan P71-A2-AP has that feature as well. So, is this the beginning of a new age of digital photo frames that can do more than just view photos? Maybe they should just make all digital photo frames into computers, but that seems to be happening already. How does pricing on these compare with…say…reviving an old outdated laptop? I have never seen one that can do this…but I have thought about my old pentium in the closet just for photos. At computex this year in Taipei, I saw a DPF with an external hard drive. A little pricey but still is available.